“It ain’t where you’re from, it’s where you’re at”… But preferably, Manchester. Throughout October, Stone Roses fans have been invited to relive a memorable year spanning an official documentary, gigs at Finsbury Park, plus an independent coming of age drama. Having attended the satellite premiere of Shane Meadow’s Made of Stone prior to those London shows, I’m amongst the fervent few itching to reappraise the film on Blu-ray. 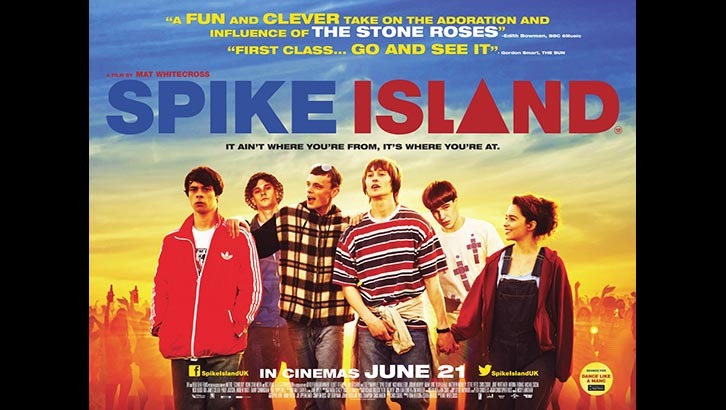 Oddly though we’ll start with a look at the one that came last only to be released first, Spike Island. This fictional feature eluded me at the cinema due to a limited nationwide release, opting instead to preorder the Blu-ray edition. For those who aren’t aware of it, Spike Island is a youthful, energetic yarn following the fortunes of four Mancunian lads desperate to crash the famous Roses gig of the same name. Bringing together a cast of virtual unknowns plus those best known for appearances on C4’s Shameless, the film was directed by Mat Whitecross and penned by Chris Coghill. Now, most will know Coghill from his uncanny Bez impersonation in the excellent 24 Hour party People – a film that in many ways set the blueprint for this one. I also had the pleasure of standing about three feet away from Chris at the Finsbury Park show and a thoroughly decent fella he is too. So he clearly loves this band and again this is another Roses film that makes no bones about gushing over messrs Brown, Squire, Mani and Reni. It should be noted though that none of the Stone Roses actually appear, but admirably the story is dotted with iconic photography and the music itself. The soundtrack is superb and you get the sense the Roses tracks have been remixed, noticeably boosted somehow from the original recordings. Add to this the highly believable and interpreted original tunes and you have the real triumph of this production. The lads at the centre of the story are asked to ‘perform’ as their own fledgling four-piece called Shadowcastre, and it works. On the whole the story bubbles along nicely and the script isn’t terrible. The main problem here though is that it tends to resort to cliche and you can easily guess the sequences before they happen. Unfortunately a by-product of Northern dramas of this kind is they have developed a cartoonish quality that they feel obliged to follow. In a dramatic sense there is nothing vintage Shameless hasn’t done better and The Stone Roses link inevitably feels tenuous. At certain points I couldn’t help but cringe at the way the band was referenced. If the film had been about a brand rather than a band, would it be ok? I mean this is surely still product placement on a blatant scale and there are moments where more subtlety would have gone a long, long way. Sadly the film also misses a beat when it reaches the titular moment. Arriving at Spike Island serves up a truly wonderful overhead CGI render of the gig. Virtually no footage remains of this 1990 show and here we get a really convincing composite of site, crowd and stage. Then (Spoiler Alert) everything takes place behind a metal green fence, budget blown it would seem. Rather than attempting to try and deliver something new and imaginative for fans, it just makes the build-up seem utterly pointless. For most Spike Island is the greatest gig most never saw, so however apt here it only confounds the frustration. So while the film sounds great, looks good and is acted ably, it ultimately falls flat plot-wise. The DVD extras feel rushed to hasten release, providing a short making of featurette, deleted scenes and oddly one of the lads drumming. It really would have benefitted from a commentary or Q&A with Chris Coghill most of all and this doesn’t seem too much to ask especially on a Blu-ray edition. Come on Chris, mate, you must have had loads to spout about it! Spike Island was released on DVD and Blu-ray from October 14th.